The Auckland metropolitan area or Greater Auckland, in the North Island of New Zealand, is the largest urban area of the country. With over 1.3 million people, it is home to nearly one-third of the country's population. Demographic trends indicate that it will continue growing faster than the rest of the country. It is an extensive urban area consisting of Auckland City (excluding the Hauraki Gulf islands), North Shore City, and the urban parts of Waitakere and Manukau cities, along with Papakura District and some nearby urban parts of Rodney and Franklin Districts. Auckland has the largest Polynesian population of any city in the world  as well as its country's greatest concentration of indigenous Maori. Auckland lies between the Hauraki Gulf of the Pacific Ocean to the east, the low Hunua Ranges to the south-east, the Manukau Harbour to the south-west, and the Waitakere Ranges and smaller ranges to the west and north-west. The central part of the urban area occupies a narrow isthmus between the Manukau Harbour on the Tasman Sea and the Waitemata Harbour on the Pacific Ocean. It is one of the few cities in the world to have harbors on two separate major bodies of water. 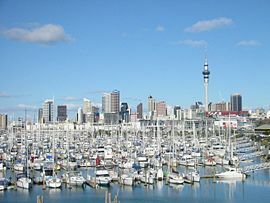 Known as the "City of Sails," Auckland has more yachts per capita than any other city in the world. Auckland is known in the Maori tongue as Tamaki-Makau-Rau, meaning "the maiden with a hundred lovers." It earned this name because it was a coveted area, fought over by many tribes due to its incredible forested hills, rich soils, beautiful beaches and abundance of seafood. Its temperate climate adds to its idyllic setting. The surrounding hills are covered in rainforest and the landscape is dotted with dozens of dormant volcanic cones. Considered a Polynesian paradise, Auckland is a melting pot of South Pacific and Asian cultures, strongly influenced by its own native Maori traditions. 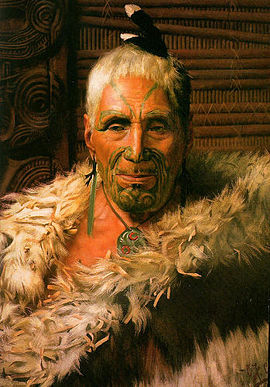 The feather cloak he wears is only worn by the noble class of warrior kings, the moko or facial tattoos told the story of his life, including his family heritage, his battles and his skills. The Green stone earrings and Tiki pendant are sources of power, authority and protection. Māori population in the area is estimated to have peaked at 20,000 before the arrival of Europeans. This event - and the guns which they traded to local iwi - upset the local power balances. This resulted in extensive inter-tribal warfare, which together with some introduced plagues resulted in the area having relatively low numbers of Māori when European settlement in New Zealand began in earnest. After the signing of the Treaty of Waitangi the new Governor of New Zealand, William Hobson chose the area as his new capital. He named the area "Auckland" for George Eden, earl of Auckland, British first lord of the Admiralty and later governor-general of India. Hobson founded the town of Auckland on September 18, 1840. However, even in 1840, Port Nicholson (later Wellington), was seen as a better choice for an administrative capital, due to its proximity to the South Island, which was being settled much more rapidly. At the same time, Auckland was the capital and principal city of the Auckland Province, until the provincial system was abolished in 1876. Nonetheless, even after losing its status as the national capital in 1865, immigration to the new city stayed strong. Rangitoto island as seen from North Head. Auckland is located at 36’ 51” South and 174’ 47” East. The Greater Auckland area lies on and around an isthmus, less than 1.2 miles (2 km) wide at its narrowest point, between Mangere Inlet and the Tamaki River. There are two harbors in the Auckland urban area surrounding this isthmus, Waitemata Harbour to the north, which opens east to the Hauraki Gulf, and Manukau Harbour to the south, which opens west to the Tasman Sea. Auckland straddles the volcanoes of the Auckland Volcanic Field. The approximately 50 volcanic vents in the field take the form of cones, lakes, lagoons, islands and depressions, and several have produced extensive lava flows. Most of the cones have been partly or completely quarried away. The individual volcanoes are all considered extinct, although the volcanic field itself is merely dormant. The most recent and by far the largest volcano, Rangitoto Island, was formed within the last 1000 years, and its eruptions destroyed the Māori settlements on neighboring Motutapu Island some 700 years ago. Rangitoto's size, symmetry, and its position guarding the entrance to Waitemata Harbour and its visibility from many parts of the Auckland region make it Auckland's most iconic natural feature. It is eerily quiet as almost no birds or insects have settled on the island due to the rich acidity of its soil and type of flora that has adapted to grow out of the black broken rocky soil. Bridges span parts of both the city's harbors, notably the Auckland Harbour Bridge crossing the Waitemata Harbour west of the Auckland CBD. The upper reaches of the Manukau and Waitemata Harbours are spanned by Mangere Bridge and the Upper Harbour Bridge respectively. In earlier times, portage paths crossed the narrowest sections of the isthmus. 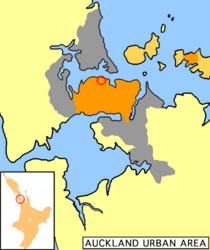 Schematic map of Auckland showing Auckland City in orange, the Greater Auckland Area in gray and the City Center located by the red circle. The Auckland Regional Council (ARC) is one of the elected local government authorities of the Auckland Region. It consists of a chairman and 12 councilors. The ARC was created as the successor of the Auckland Regional Authority. Unlike the territorial authorities of Greater Auckland, it has an umbrella function covering all the various cities and districts making up the region, but its regulatory power and funding abilities are in turn restricted to several areas including public transport, environmental protection and regional parks. The ARC is an elected body, and collects its own revenue mainly by property taxes (or rates). Territorial authorities are the second tier of local government in New Zealand, below regional councils. In November 1989, central government restructured local authorities throughout the country. Auckland City was merged with eight smaller local authorities to form a new Auckland City Council. The new city had double the population of the old and the amalgamation set the present-day boundaries of the city. Auckland City Council consists of a mayor and 19 councilors with elections held every three years. Several islands of the Hauraki Gulf are administered as part of Auckland City, though they are not officially part of the Auckland metropolitan area. Parts of Waiheke Island effectively function as Auckland suburbs, while various smaller islands near Auckland are mostly recreational open space or nature sanctuaries. 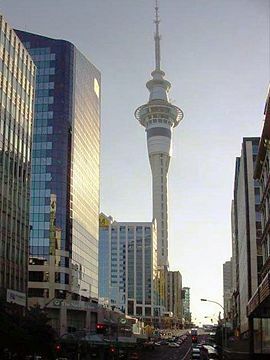 Many major international corporations have an Auckland office, as the city is seen as the economic capital of the nation. Financial and business services are located here, making up a large percentage of the Central Business District (CBD) economy. A large proportion of the technical and trades workforce is based in the industrial zones of South Auckland. The largest commercial and industrial areas of Greater Auckland are in the southeast of Auckland City as well as in the western parts of Manukau City, mostly in the areas oriented towards the Manukau Harbour and the Tamaki River estuary. 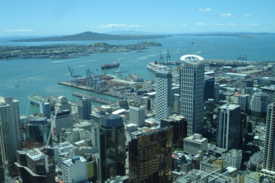 The principal exports through Auckland’s ports include iron, steel, wool, dairy products, and meat and hides. Its imports include petroleum, iron and steel products, sugar, wheat, and phosphates. The Greater Auckland area also supports engineering, publishing, and metal trades; the manufacture of paint, glass, plastics, chemicals, cement, and a variety of consumer goods; vehicle assembly and boatbuilding; and food processing, brewing, and sugar refining. In 1969, a large iron and steel mill was opened at Glenbrook (20 miles [32 km] south), and in 1977 construction was completed of a natural-gas pipeline running from the Maui field to Auckland. Auckland is home to many cultures. The majority of inhabitants claim European - predominantly British - descent, but substantial Māori, Pacific Islander and Asian communities exist as well. The 2006 Census by Statistics New Zealand listed 137,133 (or 11.1 percent of the Auckland population) persons that stated Māori as being either their sole ethnic group or one of several ethnic groups they belong to. 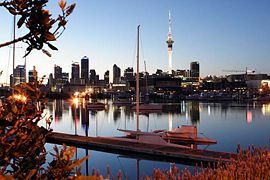 Auckland has the largest Polynesian population of any city in the world and a higher proportion of people of Asian origin than the rest of New Zealand. Pacific Peoples accounts for 14.3 percent of the Auckland population while 18.8 percent claim Asian heritage. Ethnic groups from all corners of the world have a presence in Auckland, making it by far the country's most cosmopolitan city. 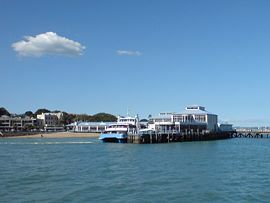 Ferry travel is a popular type of public transport for some Auckland destinations. 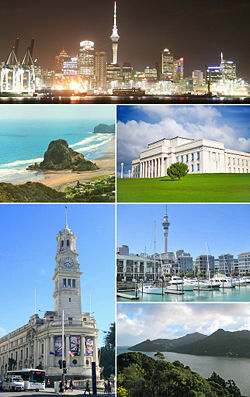 Auckland has a number of important educational institutions, including some of the largest universities in the country. It is also known to be a major center of overseas language education, with large numbers of foreign students (particularly East Asians) coming to the city for several months or years to learn English or study at universities. There are approximately 50 "NZQA" certified schools and institutes teaching English in the Auckland area. Among the most important tertiary educational institutes are the University of Auckland, Unitec New Zealand, Auckland University of Technology, Massey University, the Manukau Institute of Technology and AIS St. Helens that specializes in international students. Auckland - Skyline from Westhaven Marina. City Of Sails - View over the Westhaven Marina. Auckland CBD at night, with the Captain Cook Wharf part of Ports of Auckland in the foreground. 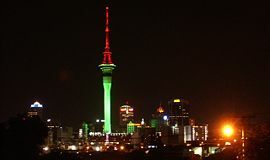 Sky Tower illuminated in Christmas colors during the month of December. The city is home to 60 galleries, the largest of which are the Auckland Art Gallery and the New Gallery that contain more than 100,000 works, housing the county's most significant collection of New Zealand and European art. Live theater, comedy, music and drama performances take place year-round at Auckland's many theaters and entertainment centers. The magnificent 'Pou Kapua' (a significant Maori and Pacific Island arts show-piece and the largest totem of its type in the world) is on display in Manukau. Daily Maori cultural performances are held at the Auckland War Memorial Museum, featuring Maori mythology, genealogy (Whakapapa) and spirituality (taha wairua). The world's largest collection of Polynesian artifacts and the history of Maori culture and its people can be seen at the Auckland War Memorial Museum. A guided walk of Mt. Eden celebrates Auckland's unique cultural heritage with the most accessible remains of the pre-European Maori occupation etched into the slopes of Auckland's volcanic cones. Auckland also boasts a symphonic ensemble in the Auckland Philharmonic Orchestra. As in the rest of the country, more than half (58.4 percent) of Aucklanders are nominally Christian, but fewer than 10 percent regularly attend church and almost 30 percent profess no religious affiliation. Included in the Christian figures are several Maori Christian denominations including Ratana Ringatü. The main Christian denominations are Roman Catholic, Anglican and Presbyterian. Pentecostal and charismatic churches are the fastest growing. A higher percentage of Polynesian immigrants are regular churchgoers than other Aucklanders, although church attendance drops off in second or third-generation Polynesian Aucklanders. Auckland Domain is one of the largest parks within the city, situated close to the Central business district and having a good view of the Gulf and of Rangitoto Island. Smaller parks also close to the city center are Albert Park, Myers Park, Western Park and Victoria Park. While most volcanic cones in the Auckland Volcanic Field have been affected by quarrying, many of the remaining cones are now ensconced within parks, and retain a somewhat more natural character than the surrounding city. Prehistoric earthworks and historic fortifications feature in several of these parks, including Mount Eden, North Head and One Tree Hill (Maungakiekie). Other parks around the city are in Western Springs, which has a large park bordering on the MOTAT museum and the Auckland Zoo. The Auckland Botanic Gardens are located further south in Manurewa. Sport is a very important part of all New Zealander’s lives and especially for Aucklanders. Viaduct Basin hosted two America's Cup challenges (2000 Cup and 2003 Cup). With the sheltered Waitemata Harbour at its doorstep, Auckland sees many nautical events, and there are also a large number of sailing clubs in Auckland, as well as Westhaven Marina, the largest in the Southern Hemisphere. The Blues (formerly known as the 'Auckland Blues'), that competes in rugby union’s Super 14 competition between teams from New Zealand (5), South Africa (5) and Australia (4). The Warriors, competing in rugby league's Australian Rugby League competition. The Auckland Aces, that competes in New Zealand’s national cricket competitions. The New Zealand Breakers, competing in the Australian National Basketball League. A netball team playing in the new Australian and New Zealand Netball League. New Zealand's All Black Rugby Union Team performing the Haka. The America’s Cup yachting race finals in 2000 & 2003. 1987 Rugby World Cup Final. International tennis tournaments including the Heineken Open (men’s) & the ASB Classic (women’s). The 2.8 kilometer (1.8 miles) 'Cross Harbour Swim' from Devonport to Auckland. The 8.4 kilometers (5.2 miles) 'Round the Bays' fun-run. The Auckland Marathon (and half-marathon). The Sky Tower is the tallest free-standing structure in the Southern Hemisphere at 328 m.
Auckland Civic Theatre - a recently renovated famous heritage atmospheric theatre in downtown Auckland. Auckland Town Hall - built in 1911, this concert hall is considered to have some of the finest acoustics in the world. Auckland War Memorial Museum - a large multi-exhibition museum in the Auckland Domain, known for its impressive neo-classicist style. Aotea Square - the hub of downtown Auckland besides Queen Street - often the site of crafts markets, rallies or arts festivals. Britomart Transport Centre - the main downtown public transport center located in a historic Edwardian building. Eden Park - the city's primary stadium and a frequent home for All Blacks rugby and Black Caps cricket matches. Harbour Bridge - connecting Auckland and the North Shore. Karangahape Road - known as "K' Road," a street in upper central Auckland famous for its bars, clubs and smaller shops. Kelly Tarlton's Underwater World - a well-known aquarium in the eastern Mission Bay suburb, built in a set of former sewage storage tanks, and showing fish and sharks. MOTAT - Auckland's Museum for Transport and Technology, at Western Springs. Mt Smart Stadium - a stadium used mainly for rugby league and soccer matches. Also the site of many concerts. Ponsonby - a suburb and main street west of central Auckland known for arts, cafes and culture. Queen Street - the main street of the city, from Karangahape Road down to the harbor. Sky Tower - the tallest free-standing structure in the Southern Hemisphere, it is 328 m tall and has excellent panoramic views. Vector Arena - recently completed new events center in downtown Auckland. Viaduct Basin - a marina and residential development in downtown Auckland, the venue for the America's Cup regattas in 2000 and 2003. Western Springs Stadium - a natural amphitheatre used mainly for speedway races, rock and pop concerts. Auckland Domain - one of the largest parks of the city, close to the CBD and having a good view of the harbor and of Rangitoto Island. Mount Eden - a volcanic cone with a grassy crater. As the highest natural point in Auckland City, it offers 360-degree views of Auckland and is thus a favorite tourist outlook. Mount Victoria - a volcanic cone in North Shore City offering a spectacular view of Auckland. A brisk walk from the Devonport ferry terminal, the cone is steeped in history, as is nearby North Head. One Tree Hill (Maungakiekie) - a volcanic cone that dominates the skyline in the southern, inner suburbs. It no longer has a tree on the summit (after a politically motivated attack on the old tree) but is still crowned by an obelisk. 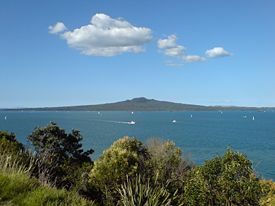 Rangitoto Island - guards the entrance to Waitemata Harbour, and forms a prominent feature on the eastern horizon. 360-degree view from Sky Tower, showing many landmarks in the Central Business District. ↑ Statistics New Zealand, Subnational population estimates at 30 June 2011 (boundaries at 1 July 2011). Retrieved March 10, 2012. ↑ The Rough guides to New Zealand.Auckland and around. Retrieved October 14, 2007. ↑ Auckland City Council.Ngati Whatua history of Auckland. Retrieved October 19, 2007. ↑ Encyclopedia Britannica. Treaty of Waitangi. Retrieved October 19, 2007. ↑ Encyclopedia of New Zealand. AUCKLAND CITY-Foundation and Growth. Retrieved October 19, 2007. ↑ The Supramics Company. Hot weather changes. Retrieved October 14, 2007. ↑ Erick Brenstrum. June 2003. Snowstorms. Ministry of Civil Defence & Emergency Management. Retrieved November 4, 2007. ↑ Auckland Regional Council Tornado Retrieved November 4, 2007. ↑ Auckland City Council. Auckland's CBD at a glance. Retrieved October 20, 2007. ↑ Ports of Auckland. Economic Impact Retrieved October 16, 2007. ↑ The Columbia Electronic Encyclopedia, Sixth Edition. Auckland. Retrieved October 16, 2007. ↑ Auckland Regional Council. Auckland's growth. Retrieved November 4, 2007. ↑ Statistics New Zealand. Regional Summary Tables. Retrieved October 16, 2007. ↑ Statistics New Zealand. Survey of English Language Providers - Year ended March 2006. Retrieved October 20, 2007. ↑ Auckland City Council Our People. Retrieved October 20, 2007. ↑ Tourism Auckland. Special Interests. Retrieved October 20, 2007. ↑ Statistics New Zealand. Religious Affiliation. Retrieved October 19, 2007. History of "Auckland, New Zealand"
This page was last modified on 26 April 2016, at 23:07.